As mentioned in my last post, I love a bit of window shopping. There are loads of really good deals on for Black Friday - here are a few of my favourites. I absolutely love these boots; they've got 30% off thanks to Black Friday, making them £98 down from £140. The Westbourne Leather Chelsea Boots come in a variety of colours - black spot, (plain) navy and this rose gold design. I think the metallic element makes them look really smart. As the name suggests, they're made with real leather, too, making them a bit of a bargain. Find them here. I always think coats and shoes are a great buy in the sale - they're things you'll wear again and again and if you think about the pay-per-wear value you're normally getting a pretty good deal. The other thing that caught my eye was the Seaparker 3-in-1 Parka from Joules has £50 off at the moment. I love the bright colour, and the fact that you can layer it up with the detachable quilted gilet. At the time of writing it was £119, down from £169. It also comes in navy, although if you prefer that colour you'll have to pay full price. Find it here. One of my favourite shops for a bit of glitz and glamour, Frock & Frill have a great sale on with some amazing discounts. Take, for example, this Sequin Strapless Black Dress. Perfect for the Christmas party season, it's down from £95 to just £40 - total bargain! Or the beautifully embroidered Aylen Skater Dress. The colourful flowers really pop against the black background, and I love the backless element. It's reduced from £135 down to £65. Find it here. I've recently got into more of a vintage style, and love 50s style dresses in particular. Collectif nail the retro look and have clothing inspired by several different decades. I find their clothes quite pricey (although they're really well made and you can feel the quality), so I tend to treat myself to a couple of things from my wish list when the sales come around. They're currently offering 30% off everything on the site. Here are a couple of my favourite pieces at the moment. I'm slightly obsessed with flamingos (who isn't? ), so I'm loving this printed dress. 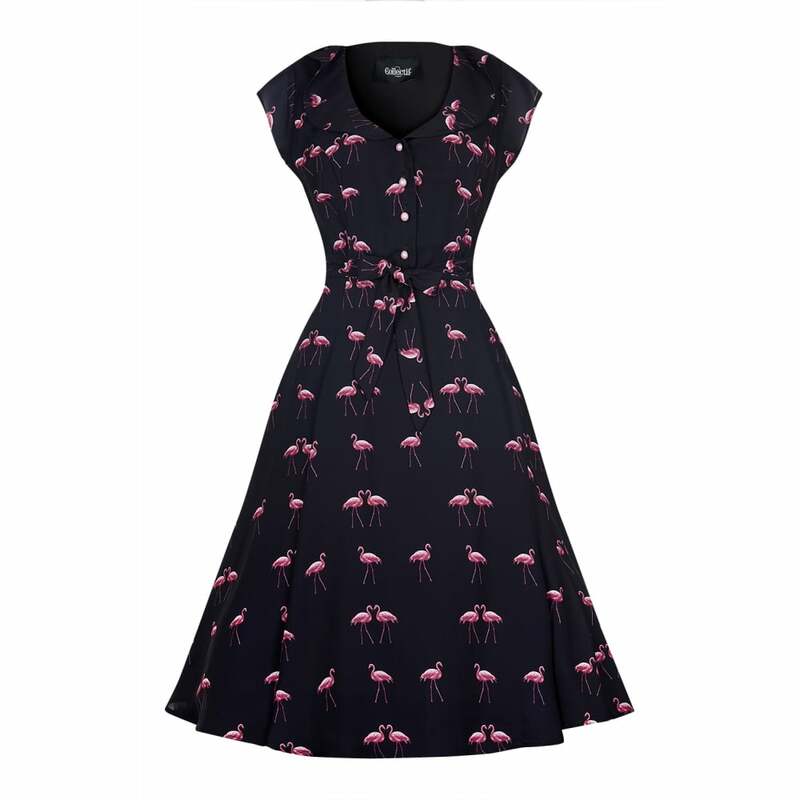 The Violet Winter Flamingo Print Dress is a very flattering shirt dress, and I reckon you could wear it in the summer or layer it up with tights and a cardi to cheer yourself up on a cold winter's day. It's £67 at full price, but with the Black Friday code it can be yours for just under £47. Find it here. The Delores 50s Cherry Print Pencil Dress screams retro; the figure-hugging dress looks like it clings in all the right places and the print is super cute. It's £50.50, so with the discount you can nab it for £35.35. To get the discount, use the code BF30 at the checkout.